This year's spring musical is a whole school affair! What do you get when you combine the crew of a cruise ship and its courageous captain, the president of a cruise line (in the company of his sisters, and his cousins and his aunts), the richest man in America with his entourage, and a computer club with questionable motives? The A.C.L. Pinafore, that’s what! 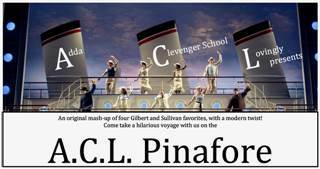 Join us on a madcap cruise — an original mash-up of four beloved Gilbert and Sullivan operettas, with a modern twist! All aboard! The show runs for four nights: Tuesday, April 23 through Friday, March 26 with curtain time at 5pm. All students 3-8 are in all four shows, but our fairies will be trading duties. TK and 2nd grades will be doing the Tuesday and Thursday shows. Kindergarten and 1st grades will do Wednesday and Friday. No flash photography or video permitted. Thank you!